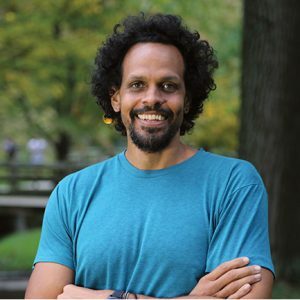 ROSS GAY was born on August 1, 1974 in Youngstown, Ohio. He received a BA in English/Art from Lafayette College, an MFA in Poetry from Sarah Lawrence College, and a PhD in English from Temple University. He is the author of three collections of poetry: Catalog of Unabashed Gratitude (University of Pittsburgh Press, 2015), winner of the 2016 Kingsley Tufts Poetry Award, and finalist for the 2015 National Book Award, the 2015 National Book Critics Circle Award and the 2015 NAACP Image Awards, all in poetry categories; Bringing the Shovel Down (University of Pittsburgh Press, 2011), and Against Which (Cavankerry Press, 2006). Gay is a founding editor, with Karissa Chen and Patrick Rosal, of the online sports magazine Some Call it Ballin’, and an editor of the chapbook presses Q Avenue and Ledge Mule Press. His honors include fellowships from Cave Canem, the Bread Loaf Writer’s Conference and the Guggenheim Foundation. He currently teaches at Indiana University and in Drew University’s Low-Residency MFA Program.